The hydraulic pipeline tester is a portable unit suitable for the accurate measurement of arbitrary and fluctuating pressure, which occur in power plants, pipelines and many other applications. To measure a pressure, masses are added to the piston unit corresponding to a pressure just below that to be measured. The total downward force of the masses is then in excess of the pressure to be measured and is balanced by the pressure produced by the spindle pump applied to the stepped area of the piston which pushes it upwards. 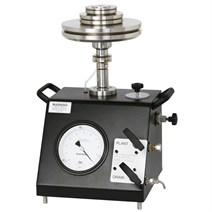 This low pressure is indicated on the precision dial pressure gauge specially graduated so that the reading of the gauge only is added to the pressure equivalent of the masses used. The weight of the mass carrier corresponds to the scale range of the dial gauge and is ignored. The piston unit and test masses supplied with this pipeline tester have been calibrated against standards which are traceable to National Standards.